Plot: Organ transplants are illegal so a gang hijacks ambulances to steal living organs. Verdict: What sort of criminal calls himself Frankenstein 2? Frankenstein maybe, you are stealing bodies after all, but the 2? Really? And what parent calls their offspring “child” rather than use its name. Decidedly clunky wording. This is a very simple four page idea. 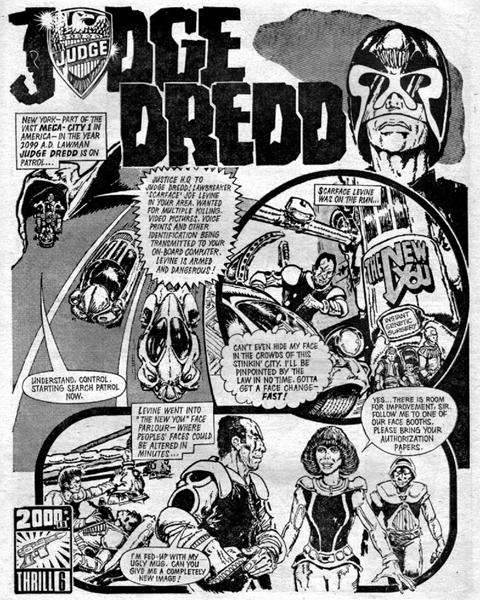 A great twist at the end sees Dredd arrest the fat cats benefitting from the illegal transplants for receiving stolen goods. Social commentary anyone? McMahon’s dynamic panel layout brings energy and crams a lot of action into a short time. Plot: A man upset by the decline of monster movies uses creatures from a special effects museum to get revenge. Not one of the brightest ones. The villain, besides having daft motivation, stops to explain his entire plan to Dredd before trying to kill him with a huge robot gorilla – the Krong of the title. Dredd speaks like he is a Scooby Doo character and he is narrating his actions out loud again. There is still an emphasis that Mega-city one is in America and the Judges are part of the police. We get to meet Maria, Judge Dredd’s cleaning lady, who talka like dis, being created at a time when funny sounding foreigners were the height of British humour. The criminal is once again hoisted by his own petard when his gorilla falls on him and kills him. 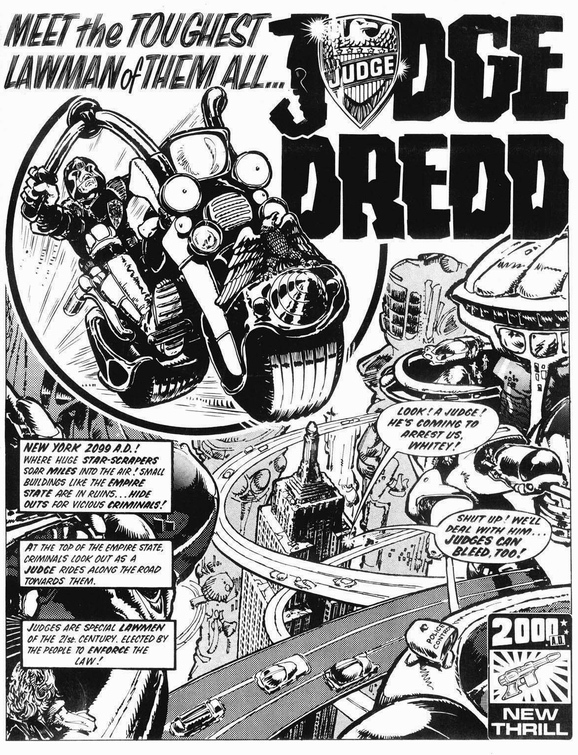 This is the first appearance of the art of Carlos Ezquerra, who was one of Dredd’s co-creators. His Dredd is very similar to Mike McMahon’s slender framed lawman. 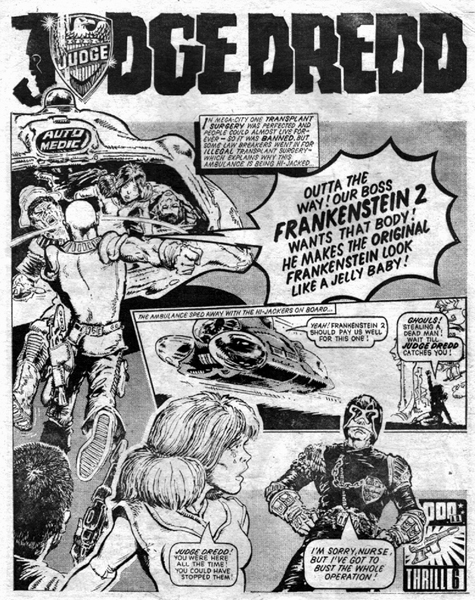 Plot: Dredd rescues the mayor’s son from a band of mutants. Verdict: Another tantalising glimpse into this future world. We journey into “a wilderness from the atomic wars” outside Mega-city one. 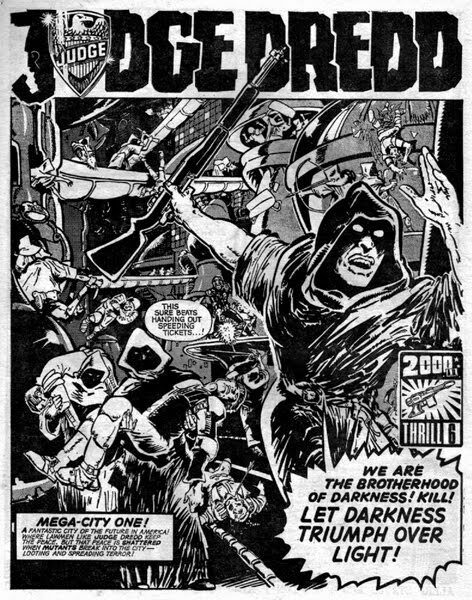 It’s the Cursed Earth but without its catchy name. Blind mutants, 40ft insects and 20th century vehicles. Dredd still talks like Superman but his internal monologue, which needlessly narrates his actions, is no longer spoken aloud. He dons a disguise and defeats his enemy in a non-lethal way. Brains over brawn. Although when his gun runs out of bullets he uses a crossbow, first as a crossbow then as a club. Round panels, art and text that bleeds across borders and no two panels the same size means this has a really dynamic feel and you believe you experience a lot of action in only four pages, the first of which is full page art. Plot: A criminal changes his face to try and escape the law but Dredd matches his voiceprint. Verdict: Good. You have a chase and a shootout; you have advanced technology like the face change machine; and ultimately the criminal is undone by his own arrogance by thinking his new appearance will fool the law. The dialogue is still a bit pretentious with Dredd spouting lines such as “you shall kill no more,” and shouting the word “jump” to no one in particular as he jumps. His internal monologue is very external. The art is very dynamic with round, curved and sometimes no panels. This really helps the story flow and gives a fast pace to the action. Mike McMahon does a great job portraying a shiny, grimy future with only black and white. His Dredd is very svelte and athletic. There is no sign of the rugged muscular lawman or the majestic chin yet. There is no doubt that fitting a good story into five pages is definitely an art. You can see tiny glimpses into a complex and detailed world but need more pages to experience its epicness. The Lawmaster bike gets name checked for the first time as does Mega-city 1. Plot: Someone is killing Judges. Dredd sorts him out. It’s rubbish. In today’s postmodern world with sophisticated readers and cornucopia of narrative techniques it is basic, exposition heavy, and clunky to read. It looks like a five year old did it. But having said that, to a young reader of the 1970’s, two months before Star Wars came out, this would be out of this world. You can see the kernel of the idea there that would snowball throughout the next three decades. The architecture, Judge’s uniforms and the Lawmaster bike are all fully formed with their iconic look and feel on day one. 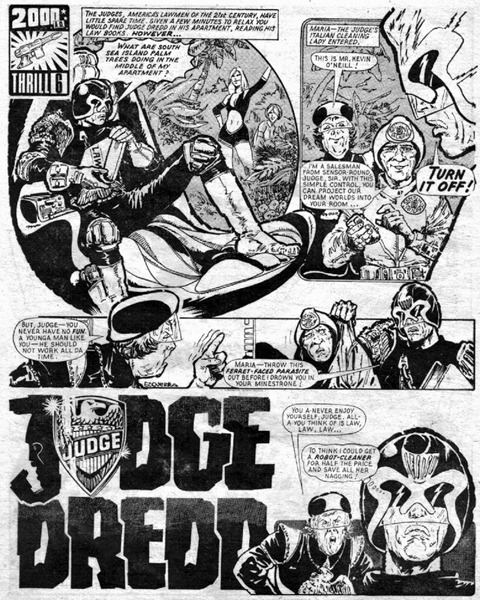 It is labelled as New York 2099AD, the Judges are elected, and are presided over by the Grand Judge (whom Dredd calls “your honour”) at Justice HQ. And Devil’s Island (a prison on a motorway island surrounded by computer controlled juggernauts) makes its first appearance. Best of all Dredd is Dredd. Stoic, indefatigable and willing to die for the law. A crude and humble beginning but a booming first step on the road to greatness. 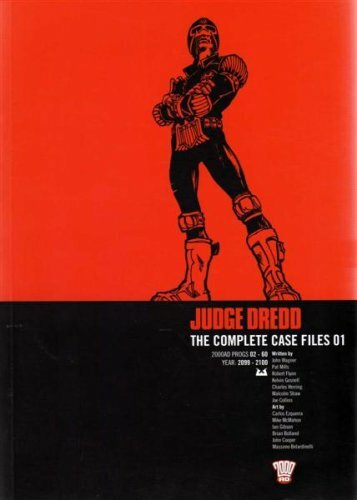 My local library has the first volume of the Judge Dredd Case Files. These collect the Judge Dredd stories into a handy omnibus. Certainly is a lot easier than hunting down second hand issues of 2000AD. It’s been a while since I read any Judge Dredd. I was – and hopefully still am – a big fan. I hear all sorts of rumblings about how it has changed so it is about time I had another look. I figured I would go back to the beginning to revisit the classic stories and dredge up some fond memories of my youth. I probably should have done a bit more research before just jumping in on this as I don’t know how many stories there are now. It has been about 35 years so I think he has got a bit of a head start on me. Well I will start slowly with one Prog (issue) per day and then pick up the pace as I get into the swing of things.